Something that many people unfamiliar with Switzerland do not know is that it is a multilingual country. Switzerland has four national languages: German, French, Italian, and Romansh. Contrary to what some people believe, this does not mean that every Swiss person can speak all four languages. In fact, although many (if not most) people are multilingual, they tend to stick to the language of their region when it comes to communicating and consuming media. Every Franklin student knows the value of picking up a few words of the many languages they encounter — and when it comes to getting around in the Italian-speaking region of Switzerland, where Franklin is located, it's definitely useful to have some terms at hand. I thought I would use this post to provide some linguistic basics when it comes to the major Swiss languages. I won’t include Romansh because it is spoken by a very small percentage of the population. However, if you're interested in finding out more about Switzerland's "mysterious" fourth language, the links here and here are very informative! Keep reading if you’d like to learn some basic words and phrases that are useful to know in Italian, German, and French. I will begin with German, as approximately two thirds of people in Switzerland speak it. However, German spoken here is different than German spoken in Germany. 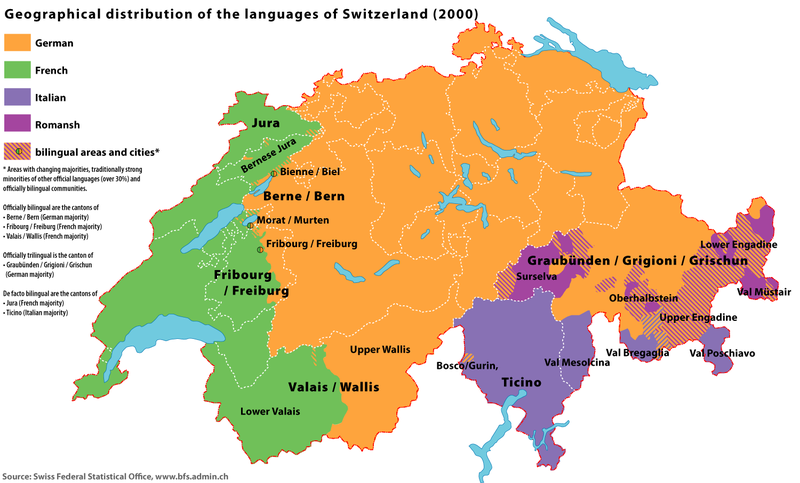 To put it briefly, Swiss German is not a written language, but rather comprised of many dialects that vary by Canton, city, and sometimes even village. There is no standardized version of Swiss German (therefore, I will not be including it in this post). Although Swiss German can be written phonetically, standard German is used in written communication, such as newspapers and formal correspondence. So naturally, you can get around perfectly using standard German, as everyone in the German-speaking region understands it! Wie viel kostet das? — How much does this cost? Sprechen Sie Englisch? — Do you speak English? Wo ist die Toilette? — Where is the bathroom? The one word in Swiss German that you should know is Grüezi. This is used when greeting people, be it in a shop or when passing someone in the street/while hiking. It is considered polite to say this word when you meet someone. Comment allez-vous? — How are you? Combien cela coûte? — How much does this cost? Parlez-vous anglais? — Do you speak English? Où se trouvent les toilettes? — Where is the bathroom? Lastly, we have Italian. Although it is only spoken by about 8% of the Swiss population, it is the most important language to know when living in Ticino! Once again, Italian spoken here is extremely similar to Italian spoken just across the border in Italy. Although Swiss-Italians say that they can immediately tell the difference between their speech and that of Italians, the rest of us are pretty oblivious to the minute details that might set them apart. Like Swiss German, there are several dialects of Swiss-Italian, but they are spoken mostly in more rural areas, so we will focus on standard Italian here. Come stai? — How are you? Bene e te/tu? — Good, and you? Di dove sei? — Where are you from? Quanto costa questo? — How much does this cost? Dov’è il bagno? — Where is the bathroom? Many thanks to Viola and Olivia for providing this table! If you can master these short words and phrases, becoming accustomed to life in Switzerland will be a breeze! Of course, they are very basic, but they should help you when meeting people, ordering at restaurants or shopping, and in staying polite overall. I hope this post was informative! Please let me know in the comments if there's anything else you would like to learn how to say. And don't forget to subscribe to this blog at the top of the page so that you can be notified whenever there's a new post.